The Three Lions 2018 World Cup squad has been announced by FA. The 23-man squad will fly to Russia with manager Gareth Southgate for the tournament which commences in June. England faces Tunisia, Panama, and Belgium in the group stages and would be favorites to proceed to knock out stages along with Belgium. Trent Alexander-Arnold and Ruben Loftus-Cheek have been included in Gareth Southgate’s 23-man England squad for the 2018 World Cup under Southgate’s plan to have young fast players with positional balance in the squad. Uncapped Liverpool right-back Alexander-Arnold, 19, has made just three appearances for England’s U21s with this his first senior call-up. While Chelsea midfielder Loftus-Cheek impressing on loan at Crystal Palace is included having played two times for England’s senior side – both of those appearances coming under Southgate and was the man of the match in England’s friendly clash against Germany at Wembley last year. Tottenham is the best-represented club in the squad with five players including Danny Rose, Kieran Trippier, Eric Dier, Dele Alli and Harry Kane. Premier League champions Manchester City and runners-up Manchester United both have four players. 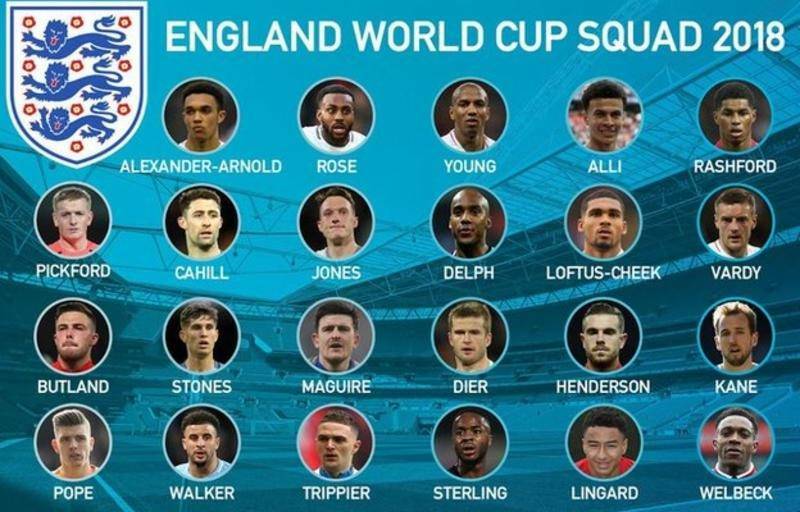 Gareth Southgate included four Man United players in his 23-man squad with Jesse Lingard, Phil Jones, Ashley Young and Marcus Rashford making the cut. Burnley goalkeeper Nick Pope has been selected ahead of Joe Hart with the 26-year-old selected alongside Jordan Pickford and Jack Butland. Joe Hart’s England career lies in tatters after he was left out of the World Cup squad. Gary Cahill found his place back in the England squad after being left out for the friendlies against the Netherlands and Italy in March, is one of that quintet and now finds himself the most experienced member of the traveling party with 58 caps. With an average age marginally over 26, this will be the third youngest squad ever selected by England for a World Cup. However, there was no place in the team for Smalling, despite a solid season which has seen him at the heart of a Premier League defense which only conceded 28 goals and putting up a stellar show in the Manchester derby scoring the winner. Smalling was also impressive against Harry Kane during the Reds comeback win over Tottenham in the FA Cup semi-finals. The forward line has four contenders who pick them self up with Harry Kane, Jamie Vardy, Marcus Rashford, Danny Welbeck making into the squad will be in-charge of scoring duties. Harry Kane with 30 goals this season will be the leading man for Three Lions as Jamie Vardy or Marcus Rashford could pair the Tottenham man upfront in the playing XI. Gareth Southgate speaks after revealing his England squad for the World Cup. “I believe this is a squad which we can be excited about,“ he said.